Nan Drye: Where did Fall go? Whew! What with my daughter moving, several fairs and my husband having his fourth "cardiac event" (makes it sound like something I need to send out invites for) the fall just disappeared! My daughter is moved, her cats are back with her and my husband is on the mend so now I can get back to making things. 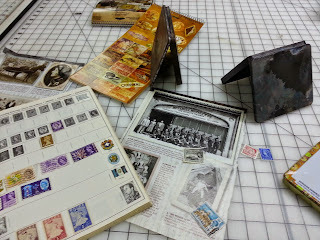 This flutter of stuff is the beginning of a collaged box for a special order. It is nice to be in the studio again! This time of year, I crave creative time. What a busy fall for you....now time to sink into winter.